When a story or another person affirms ideas that you thought were only in your head, then that is a good story. More than once while reading this, I had to pause and reflect. Ms. Barker puts into words some things that made sense to me, things that I saw at work in my own life. They may seem like simple truths, but that does not make the concepts any less true. She shares a few anecdotes about her grandson and how he saw the world through the "eyes of a child". I recommend this and then challenge you to look at your world with new, young eyes. 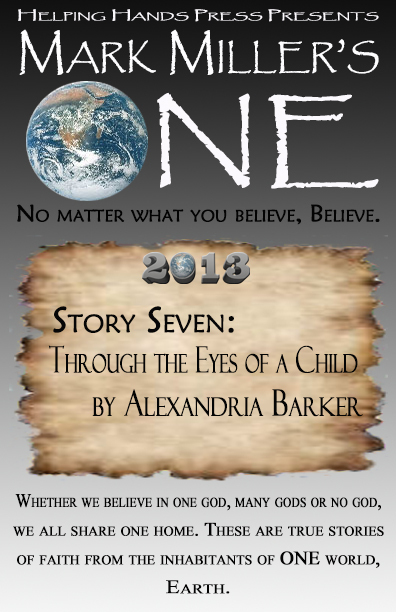 100% of the author’s proceeds will be donated to Bridge to Ability Specialized Learning Center, a not-for-profit organization serving the educational and therapeutic needs of fragile children with severe physical and cognitive disabilities. www.BridgeToAbility.org. 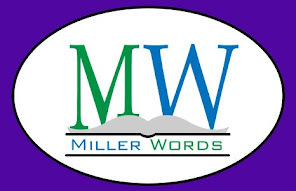 The authors, creator and publisher are in no other way affiliated with this organization. 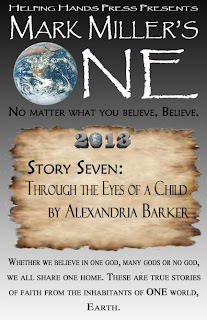 In Story Seven, Alexandria Barker shares her understanding of the Law of Attraction as it applies to our spiritual being. She offers some simple explanations that she learned firsthand through her grandson. We are born into this world without an instruction manual. Alexandria has a few techniques that can help shape our energy while we’re here. Keith will be making his first appearance at Authors in the Park's Booktoberfest on October 5th (Details HERE). In the meantime, he would like to discuss the challenges of genre hopping and plotting out a good story. You started it, how are you going to finish? 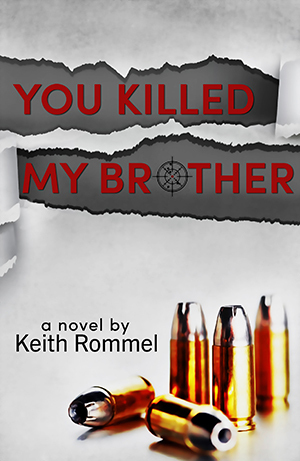 As I pushed through the first draft of You Killed My Brother, I started to doubt the story was good enough. I had always written in psychological suspense with elements of horror, and never psychological crime. I wanted to jump genres to prove that I could do it. So when I started the editing process and began to work out the finer details of the plot in You Killed My Brother, I got about halfway through when I placed my red pen down (yes, I handwrite my manuscript as well as my edits). That is when I gave up on the story. For the first time in my writing career, I was battling self doubt and questioning my capabilities as a writer. What I had written was crap and I needed to get away from it. Forget it ever existed. The idea that I had spent months, had lost hours upon hours of sleep, had chosen THAT story to write and I abandoned it was nothing short of quitting. That bothered me. I’m not a quitter. That’s not the trait of a writer. We put our time in, bleed out an array of emotions, work out painstaking details and hope our readers connect with what we do. I needed to see that with this novel. I started something, but allowed frustration to get the better of me. I abandoned it and thankfully it was calling me back. But how was I going to finish it and not fall into the same trap? I stumbled across old outline notes on You Killed My Brother and saw that although some of the details of the story had changed, the original story concept and theme had remained intact. It was a powerful message about revenge. It is a story I purposely geared towards a broader audience than my prior two novels. I wanted people to see what would happen when criminals collided with the wealthy and make it as real as possible. Seeing my initial passion for the story rekindled my flame, and in a period of time about a month long, I finished the rewrite and completed the novel. And I’m glad I did. It seems the ending has left people a little surprised and I’ve had multiple reader requests for a sequel which I’m currently considering. So now I’m curious, what have you done that might have helped you through a similar situation? About the book: How far would you go to make someone pay for hurting a loved one? Rainer is a successful doctor and father of two. He's a celebrated member of the community for his exceptional care and charity work. Brick is a local street thug that can't keep his nose clean. When fate brings the two together through tragedy, the life of Rainer is changed dramatically, setting into motion events that change communities. Glenn is a seasoned cop and Rainer's younger brother. Trusting the justice system, he keeps his desire for revenge in check as Brick is brought to trial. But when the jury hands Brick a lean sentence, Glenn sets out to avenge his family's suffering. But what he forgets in his rage is that for every action, there is a reaction. About the author: Keith Rommel is a native of Long Island, New York and currently lives with his family in Port Saint Lucie, Florida. Keith is a retail manager and has enjoyed collecting comic books since he was a child (a hobby inspired by a teacher in grade school to help overcome a reading comprehension disability). 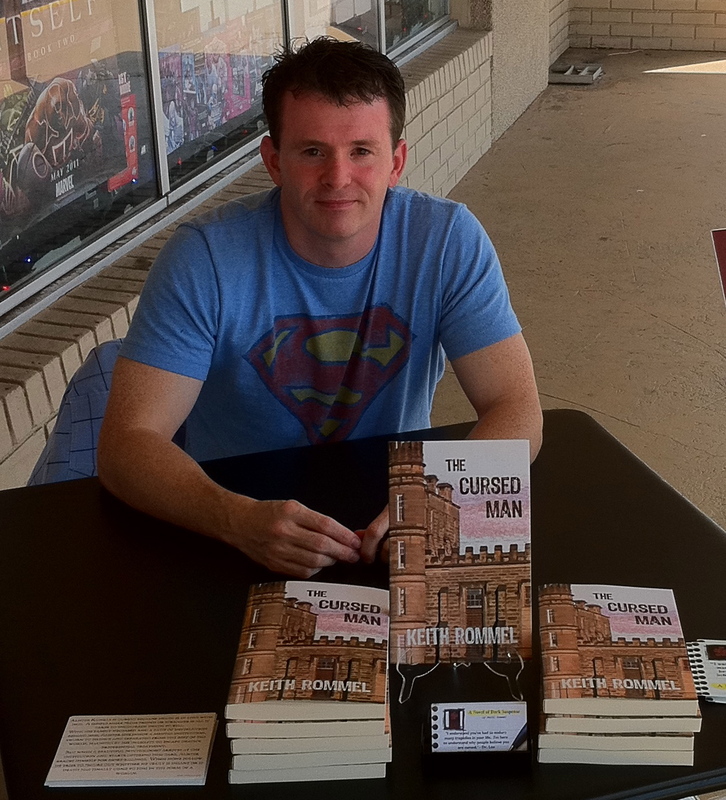 Keith Rommel is the author of the critically acclaimed dark suspense Thanatology Series entitled The Cursed Man and the Lurking Man. His newest novel: You Killed My Brother is a fast-paced suspense thriller with crime and some rather unorthodox police work. Keith has had several writer how-to articles published and has appeared on numerous radio shows and at many signing events. 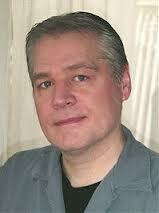 Keith is currently hard at work on the third novel in the Thanatology Series due out summer 2013. Today's guest brings us a little excerpt from his family-friendly book Gazpacho. Oh what a glorious light it was, so brilliant, bold and white. The light was so magnificent and powerful that I struggled in vain with my yet unopened eyes to gaze directly upon it. At first, with only but a glance and then with only a glimpse, I attempted to shield my newborn sight with the aid of the tiny hands and fingers that appeared there before me all aglow and bathed by the radiant light. I quickly learned that each precious digit was mine to command. 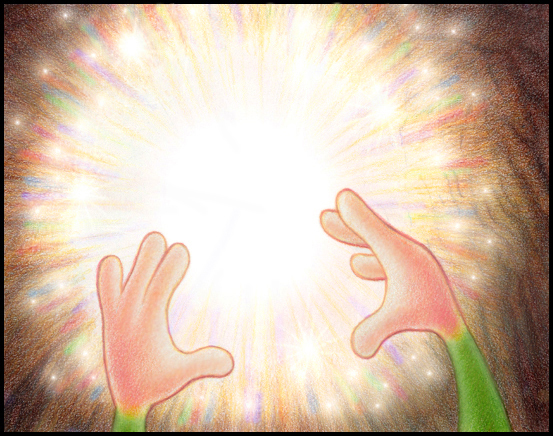 And, once I did, every one of them was sent out on the same mission of exploration, toward the light, filled with the hope and desire to touch it. Floating mere inches above me from where I lay, the light hovered ablaze, in all of its divine splendor, just out of reach. I soon came to understand that the light was never meant for me to touch in that way, but it was there for me to feel in a different way, instead. From somewhere deep inside myself I felt the incredible presence that was within it and it reached out to me with a message of love. As my eyes adjusted and grew more accustomed to the light, I marveled to behold a multitude of colorful rays on display. They danced, flickered and sparkled out from its center in every direction possible. All to a dazzling effect that filled me with joy. Not a sound did it make, but even in the first few moments of my life, I knew that, somehow, the light had come to greet me and to help see me into the world. And I loved the light, almost as much as I felt the presence within it love me. Soon after I had made the connection with it, however, the light pulled away, faded and left. I didn’t like to see it go, but I was so very glad for the time that it had come to be with me. Even more than that, I was ever so grateful for the experience it left me with, to have known, felt, and witnessed something that was that good. As those moments faded away, all of my physical senses took on a greater awareness. For the first time I heard soothing and comforting voices around me. At first the voices were faint, but before long, I could hear the sound coming from somewhere near me. Although I couldn’t understand exactly what they were talking about, I could feel that they were saying all kinds of nice and wonderful things just for me to hear. Love is also what I felt from them. And even though it was somehow different from the love that I felt from the light, the feelings were unmistakable and I loved them very much too! So… this is what it’s like to be alive. Well hey, this certainly feels great! I really like it here! About the Book: Gazpacho , a "Rarus Nimus Foetidus Loquaciatis Rauca Mollis" is a newly discovered species of worm that has the ability to communicate with most every living creature. But what his species is most known for, throughout the bug and animal world, is their highly toxic glands that produce a considerable amount of stink whenever they are stressed or in danger. This toxic "handicap" or stinky "gift", depending on how it comes to be used, sets the stage for Gazpacho's early years just as it serves to enrich his life experiences and fuel his grand adventures. From his birth in the northern forest glen to his plan of becoming the next great singing star and idol sensation, Gazpacho learns of love as he overcomes the many obstacles and prejudices against him to finally summon up the courage to leave home and live out his dream! This is the first book in a series of four that tell Gazpacho's amazing life story! About the Author: Robert Michaels (Robert A. Nicpon) was born in Chicago, Illinois and he lived there until the age of 7. It was during Robert’s high school years that he discovered his passion for art, and it was in his last year of high school that he decided that he wanted to produce art for a living. In 2006 Robert learned that what really matters the most when producing a work of art is telling “The Story” and telling it well. When this was discerned, Robert received the inspiration to write the story of Gazpacho. 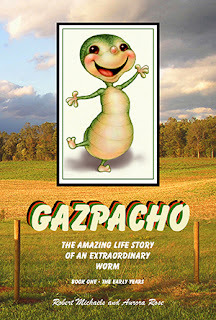 With the help of his beloved coauthor Aurora Rose, Gazpacho’s story has grown into a four book series that chronicles Gazpacho’s amazing life. Today's guest comes to us from the wilds of Alaska and back again. 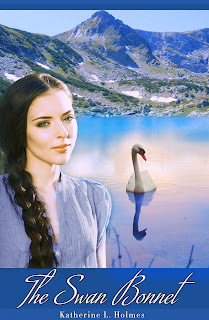 Katherine Holmes makes a stop on her blog tour with some background info on her novel The Swan Bonnet. We tend to absorb the history of our environment As it was for many, Alaska was romantic to me as a frontier, romantic while living in the city. Of a sudden someone would leave Minneapolis for Alaska. My brother went there to do legal work after he had worked with Indian Legal Aid in Duluth While he was on the south coast, I thought of moving. I read up on the state and became caught up in its history. The near extinction of swans in the United States had me thinking about settings and soon I was planning a story. Learning about Alaska was like learning grammar through a foreign language. I've never read a history book about Minnesota though I have Midwestern ancestry going back to the mid-1800s. Mining hopes in Alaska were very similar to those on Minnesota's Iron Range in the early 20th century. The influx of people in Northern Minnesota had similarities to Alaska’s new population. Sometimes they were the same people. Like Alaska, the fur trade began Minnesota history. I'd heard much about the 1920s on the Iron Range from my mother. Boomtowns and sudden wealth mapped the region. After being fascinated with two books of Alaskan history, I researched swans. I read how warehouses with thousands of swan pelts were discovered, more than 10,000 at a time. Eventually hunting laws were enforced and a successful environmental chronicle was documented. I began my Alaska story as a shorter fiction about an Irish immigrant couple who bought shore property where swans migrated. But soon the story led to a coastal town and characters emerged. When I thought of the swans being killed in masses, I knew that few women were part of such a money-making venture. How much did women help such an environmental campaign in a lone setting when a particular species were illegal to hunt? It is known how women responded to Prohibition then. I posted the book at Authonomy.com in 2009 while I began to re-work the historical detail. I was afraid the swan hat would seem far-fetched. But it wasn't historically. The West established its own dress. I actually hadn't seen Chaplin's The Gold Rush and later, when I watched the VHS, the women's fur hats were part of the entertainment. Not until I was rewriting the book did I realize the inspiration for the swan hat. Of course, it was meant to be the white hat of the western. But I remembered from my grade school years the pheasant pelts one of my brothers brought home after hunting. He hung the pheasant pelts on the wall of his room and then in the basement. These pelts fit neatly on the head so that, with my friends, I wore a pheasant hat - until my mother found out and scared us about lice. There is some kind of method to storytelling after all. 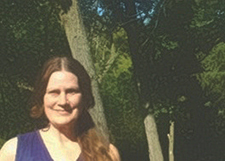 About the author: After stints in publishing and as a reporter, Katherine L. Holmes obtained an M. A. in Writing from the University of Minnesota. Her poems and short stories have been published in many journals. In 2012, her short story collection, Curiosity Killed the Sphinx and Other Stories, was published by Hollywood Books International. She has also published a children’s fantasy, The House in Windward Leaves. The Swan Bonnet is available in eBook and paperback. Look for it on BN Nook and Kobo too! Now, if you are still reading and haven't clicked off to Amazon to get an incredible story for a great price (each volume is only $0.99), I have a serious question. How far would you go to keep your faith? This is the tagline for the series, but it is also a serious question. I have four children and it is sometimes a question on my mind. The answer seems obvious. What would you do to protect your children? 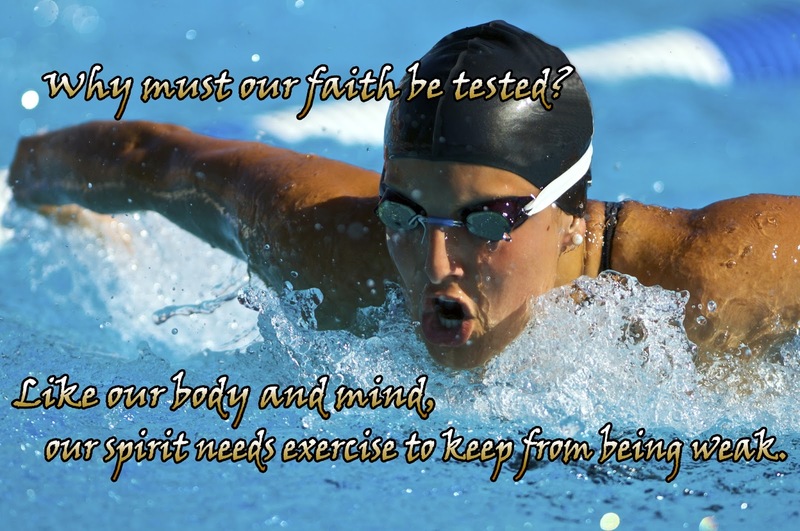 Isn't that a lot about faith? You have faith that your actions will benefit your children. You also try to teach them your own spiritual faith for them to pass on to others. 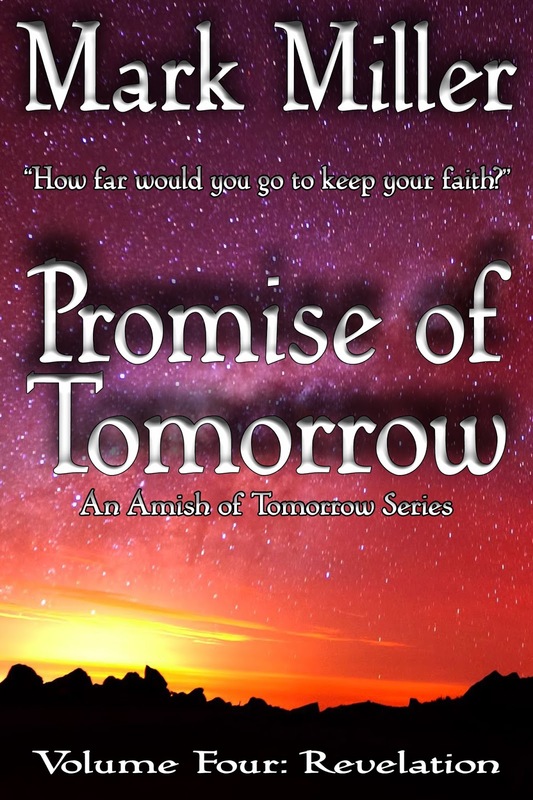 In my story, the Umble family is faced with the possibility of losing their faith entirely. They are cast into the unknown and everything is a challenge. In Volume Four, it is revealed that things are likely becoming worse. 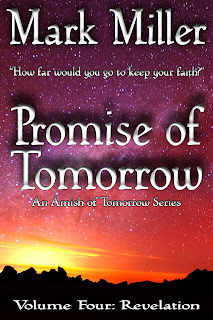 Can they keep their faith when it seems their faith has left them? I would appreciate a few comments below about your faith - when you were challenged and how you came through it. Sometimes, I feel like my faith is tested on a daily basis. With four kids, I know my patience is!